Things are never dull on our peony farm. The digging crew continues their quest to dig all the peonies for our first ship before the hot and muggy weather sets in early next week. Rumor has it that the crew may complete this quest tomorrow or Sunday at the latest. That same sentiment echos throughout the process as the washers, dividers and finish processors also stepped up to that quest. As I mentioned in an earlier post, our goal is to get them into the cooler as quickly as possible. Things were going alone very well until a huge boom and glass came flying out of our outside spotlights on our processing barn. Silence then set upon our property as the coolers went quiet, water stopped flowing out of the hoses and no sound out of the speakers from our favorite radio station. Thankfully Cara was not hurt from the falling glass fixtures and no one at that time was holding anything that was electrical. Danny called as he was heading down the driveway to let us know that one of our power lines was on the ground. YIKES! A call into our electric coop ensued and at least for us, many prayers were ushered up thanking our Great Lord that Cara and others were not hurt and a quick response to repair the line so the coolers could get back online. When the linesmen arrived the cause of this accident was a truck and trailer that was carrying a corn crib ripped off the lines hanging over the road on 70th Street. Needless to say these hoodlums continued on there merry way down 70th Street and broke other power lines that fed into various farms. The linesmen were not happy and are currently looking for these hoodlums. So after a 3 hour siesta, all crews resumed their now faster pace knowing that all parts to this process are working normally. The only residual damage to the power surge are a couple broken out light fixtures (that weren’t even turned on) and the electric fence charger that was also fried in the cattle barn. According to the linemen, this was a minor surge after the power line was cut. We are very thankful though that all members of our crew were safe and life on the peony farm continues for another day! What has happened to the peony digging crew? Guess this is what happens after six days of digging peonies! Not sure if the added cattails and mud items are used to line up the New Holland tractor for digging up the peonies…whatever works is ok by me! Seriously though, Danny and his crew are doing a great job and are 70% done with the first dig. Our goal at Swenson Gardens is to dig, divide, process and pack as quickly as possible so we can store in one of our coolers until they are picked up or shipped. Every order is freshly dug so that you may receive the healthiest roots possible. With rain forecasted for tomorrow, the crew is on a fast pace as digging in the rain is no fun. Now singing in the rain is great, so digging and singing in the rain for peonies is the BEST! Right peony digging crew? Yes peony gardening friends the PEONY BARN SALE is on! Mark your calendars, fill up the vehicles with friends and family and visit us on Saturday, September 5th and Saturday, September 12th from 9 am to 5 PM. Left over retail roots and the wholesale bag roots will be set up in our processing barn for your viewing…and buying pleasure! First come first served and once they are gone…they are gone to their new homes! CASH AND CHECK sales only! NO CREDIT CARDS ACCEPTED DURING THIS SALE! As usual, do not call us to save any roots for you as we don’t know yet what will be available. If you want a specific root, please order online or mail order as this peony barn sale gets pretty crazy at times! Last day to order…September 21st! 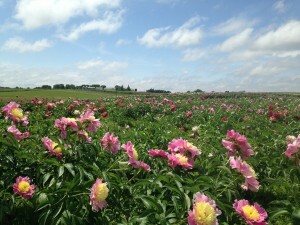 The peonies are being dug at a furious pace in order to fill all our first dig shipments. Thankfully the weather has been pleasant for the crews. Pick up days are Saturday’s, September 5th and September 12th from 9 am to 5 PM. Shipping orders on first dig should go out within that time period and an email notification will be sent to you from USPS Priority Mail if a correct email was given to us initially at time of ordering. For those of you who haven’t ordered yet, now is the time to place your order through our online store or go to our ‘How to order’ page and mail in your order. These orders are for shipment only and should go out the end of September/early October. Happy shopping and planting soon! Zones 2-5 last day to order peonies is August 21st! 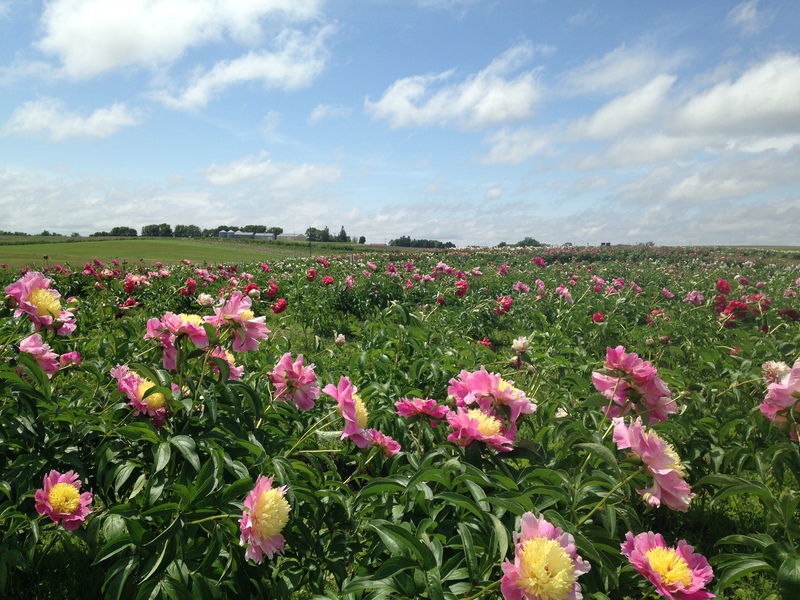 Friendly reminder for Zones 2-5 and those interested in picking up there peonies is fast approaching the cutoff date of this Friday, August 21st! With the rain starting and forecasted over the next couple of days, roots will be nice and plump and yes, heavy! The processing area was set up over the weekend and more washing stands added to accommodate the increased orders. Thanks again for letting us grow your peony roots, without chemicals, as it truly has been a labor of love from all of us at Swenson Gardens. Happy peony planting…soon! Please welcome our new peony compost team member! She was recently born and doing well. Mom, ‘Bessie’ aka ‘crooked horn’ and dad, the ever loving ‘Buford’ are doing great too! She (as ‘she’ hasn’t been named yet) will soon be playing with her other (5) siblings of Buford who were born this spring. 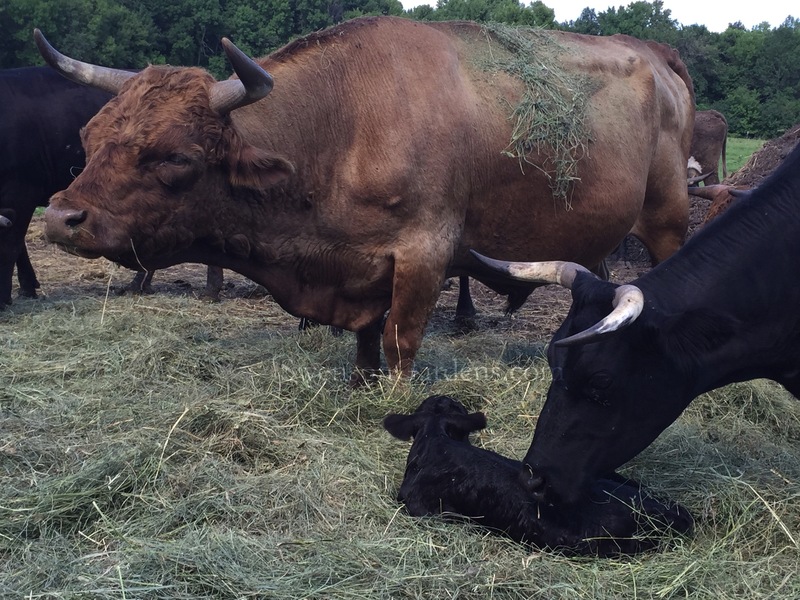 Its always amazing how fast calves can be up and around shortly after birth. Welcome ‘she’ to the peony composting team! We are so blessed to be able to spend a few days at Becky’s family’s cabin on Burntside Lake in Ely. The kids (still to us anyways) love to spend time on the water. What a great break to be able to unwind for a weekend or two over the summer. Ok so I like to take pictures too! Out came the big 400 mm Sony G glass from the dock to catch them in action about 200 yards away. Love it! Even dearest Becky brought the hand me down A77 out and was having fun. Thought I was going to fall off the dock with this lens as its field of view is very small. My oh my does it do portraits…especially with her! Can you believe this? I’ve been fishing this lake for walleyes since 1990 and have never caught one except for the few days we were up there. His first walleye EVER, let alone on Burntside, was 30″. She was released after a few photos to swim again. We think a kayak may be under the Christmas tree this year as the girls really love that sport and rented one from a local resort. Just in case your interested, pulled out the Tamron 90mm macro for this shot. For me I think a kayak is too slow compared to the 150 hp Yamaha on the boat. I guess is great though that the girls love to kayak so you know who can spend some time elsewhere on Burntside trying to catch a walleye that big! Maybe in 2030 I’ll get a chance to catch one that big if they only bite in 25 year increments! Sort’ve like growing peonies I guess. Ok last picture in this collage as I couldn’t pass this one up. Off in the distance I saw this rock shimmering above the water with the sun at the right angle. Pulled out the 400 mm G and WOW! Nice to have the gear along to shoot those special shots on the lake and in the peony fields! 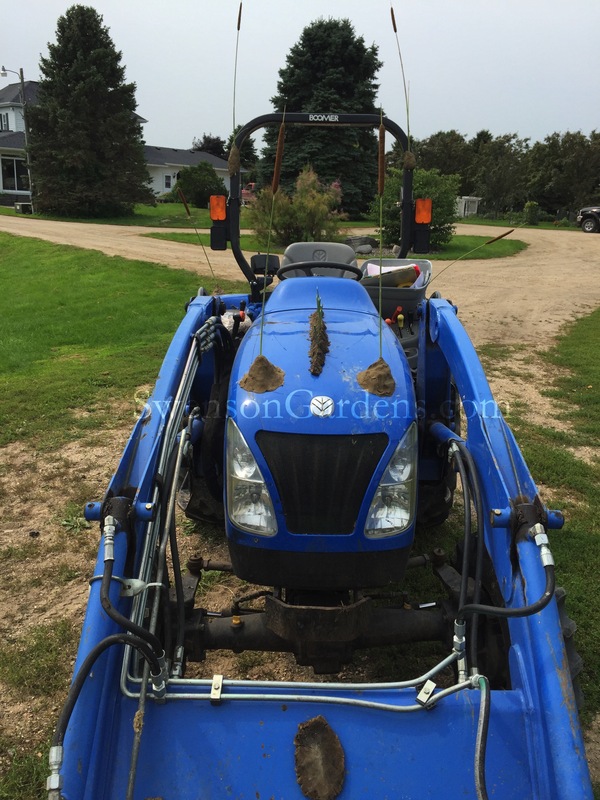 Our son too was busy at the Wright County Fair…off the peony farm. He received 7 blue ribbons for his projects and demonstrations. As you can see he was very busy during the parade of champions. Two grand and two reserve champions so on to the MN State Fair as well. He has a knack for picking projects and is a pro at demonstrations. Congratulations buddy! He was also working as a 4H ambassador during the year and at the fair. Being a very outgoing personality this fit well into his schedule. Couple that with a trip to Washington D.C. as the youth representative for our electric co-op, Wright-Hennepin Electric, a very busy summer off of the peony farm. Even our daughter gets into fun…away from the peony farm! This is her last year of competing in Western games with ‘Daisy’. She just finished with the Wright County Fair and received the overall games champion. She was awarded the 1st MN State Fair trip so will be competing at the State Fair in games and trail class. We are so proud of them as they’ve been working very hard since last spring and more importantly, over the last eight years. Yesterday she and some friends went on a trail ride and took the horses swimming. Daisy was so enamored by putting her head under water and blowing bubbles through her nose. She did it eight times and didn’t want to leave the water. The future plans for both of them are up in the air for now. Dad was very teary eyes taking this and many of the photos as this could be it for now. I remember growing up with my horse, Trigger and the day I said goodbye to him is still etched in my mind. Daisy has been a part of our family for almost eight years and not knowing if she will stay or be sold to another up and coming gamer is still to be determined. Thanks girls for all the many memories on the peony farm! In between our busy times on the peony farm things do get somewhat concerning when I try to take selfies of ‘Toby’ aka ‘Panda Bear’ and me. We’ve been trying to get all the cats and kittens to stay in the barn but its so much fun sitting on the steps in back of our house. Just don’t tell the family that I sometimes eat supper on the steps and somehow meat falls off my plate.